I didn’t expect so many people to have read my blog and responded that they wanted a follow up post. I hadn’t planned on writing anything else but so many people have asked what’s going on I figure it is only a good thing to keep the story going. The journey has really only just begun so I will continue to tell the story as long as there is one. If you didn’t see part one you can find it here. When we left the hospital yesterday we had discussed with the nurses when he would be extubated, they told us sometime between 6am and 7am. For those who don’t know (I didn’t) to extubate is to remove the breathing tube that was supplying air for him to breathe. When they remove the tube he has to be able to breathe on his own. I planned to get up at 5am and make it to the hospital in time for him to wake and begin his recovery. Because of my ignorance to the process I thought that they would wake him and extubate him within a matter of minutes however the reality is that he needs to be awake for a few hours before they can extubate him. When I arrived at the hospital he was already awake which was a bit of a disappointment however seeing him awake and not sedate was such a relief that those good feeling superseded any disappointing feelings. My father was looking good considering the major surgery he had undertaken. He had a couple hours of being awake before he could be extubated. This was particularly stressful because he had the tube in his mouth and couldn’t talk, he had his hands strapped down so he wouldn’t pull any of his tubes out in his sleep, and he was itchy as a side effect of the pain medication. The result must have been torturous as he was itchy but couldn’t scratch his itch and could tell us where to scratch. We eventually got some non-verbal communication going but that was really a rough few hours. 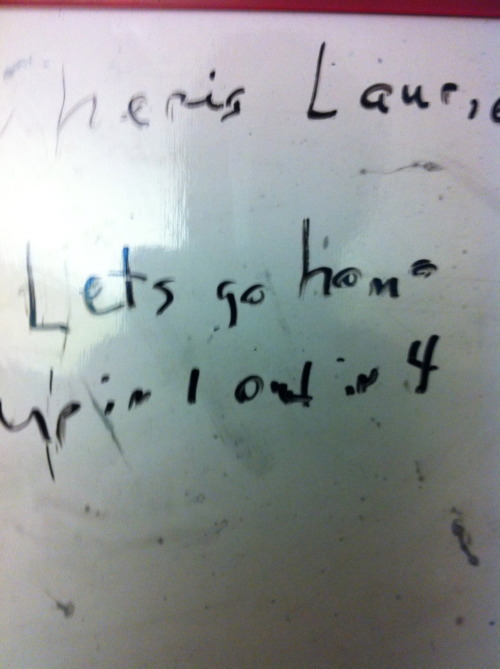 To aid in the non-verbal communication they gave us a whiteboard which we tried to use but it was tough for him to write as he was in pain and also on medication. He did manage a few messages though. Finally it was time to begin extubation. The doctors came in and did a chest x-ray and setup a machine to look into his lungs as well as suction any liquid that was in there. We got to watch a monitor as the scope went into his lungs, this was pretty cool. They suctioned everything out and took a sample to make sure there wasn’t any issues. We waited for what seemed like a long time but was really a matter of minutes for the results to come back. Everything was good so they removed the tubes. It was just Laurie (my Dads girlfriend), my brother David, and me there. 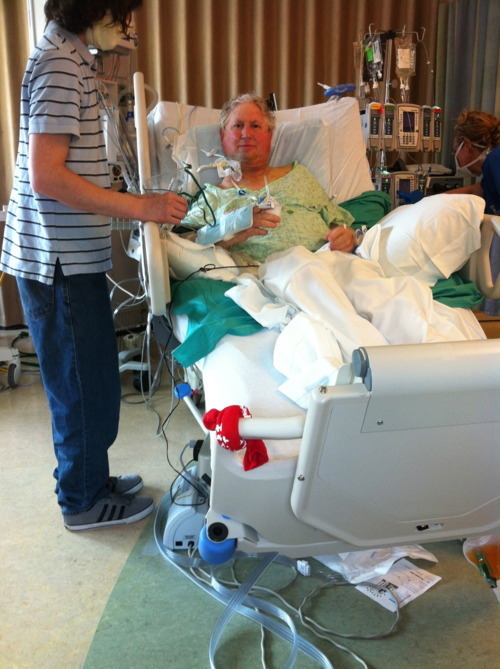 We all seemed to be very relieved that the tube was out but my Dad didn’t seem much different. They still had oxygen helping him breathe through his nose like before the surgery however he was breathing mostly on his own. To give some perspective, when we were waiting in the hospital for the lung to come he was hooked up to the hospitals oxygen system which goes up to 15 – even at 15 he had trouble breathing and talking. Now with his new lung he was at 6 and breathing better than before at 15. About an hour later they moved it down to 4 and that was still better than before at 15! During this time he started to talk. At first it was one word answers to questions but soon we was talking with much more ease and length. Once the tube was out it was clear that the biggest issue now was managing his pain. He had been on an IV drip for his pain but that had to end for them to extubate him. He wained off most the pain medication to be extubated and now he was playing catch up. Because of this the nurse was giving him periodic doses of morphine through his IV which caused a roller coaster of pain/pleasure. He would be in a lot of pain and get a dose, and then feel better, but soon the dose would wear off and again he would be chasing the pain. This was only a temporary situation until he could swallow. Once he was able to swallow he could take pills which release slower and have a more even and sustained effect. After a while he was taking some sips of water. This was a huge moment because before surgery you cannot drink or eat anything for a long time. This was the first thing he had ingested in over 2 days! He had some water and then took some liquid medication to help prevent fungus and other issues and eventually took an oxycodone which meant that he no longer needed to be on the roller coaster. I was very relieved about this. Soon after this he was given a tray of many kinds of different liquids he was able to drink. It included water, apple juice, broth, tea, and jello. I was feeling really good about his progress and everyone was saying how well he was coming along. Dr. Zamora and Dr. Mitchell both stopped by and had good things to say about this recovery. Here he is drinking some apple juice, and that’s my brother at his side. It’s amazing how excited you can get that a fully grown man is drinking apple juice. At this point I decided it was a good place to leave my Dad and have my last day at Parallel Path. I went back to Boulder and updated my friends about his progress and finished strong at work. When I left work I called Laurie who updated me on what I missed. She told me that he was still doing well and the only major thing I had missed was that he got up and moved from the bed to the chair. He spent some time in the chair and then moved back to the bed. She said he looked “strong” and “impressive” when he stood up which is definitely inspires confidence. I am really proud of how determined my father is, he is going above and beyond what the doctors are asking of him. “Up in 1, out in 4.” Up in one, check!